A few days ago, Aikido Journal linked to one of my articles, Attack of the Living Dead, and sent several hundred interested visitors my way. I sure appreciate the extra exposure and am grateful for folks' interest in Mokuren Dojo. Today I'd like to return the favor (in a small way - I don't have several hundred readers to refer) while maybe doing something to retract/correct a post I made a good while back that demonstrated my ignorance and prejudice (I do that every so often). Aikido Journal recently posted a set of links to resources on the Russian martial art of Systema. The Journal's commentary of Systema, from folks with many years experience in aikido as well as direct experience of Systema, was glowing. Indeed, from reading the articles at Aikido Journal about Systema, the teachers as well as the system seem very interesting. My earlier post stated that from what I could tell, Systema looked ridiculous. That was based on my viewing several videos that were poorly done and must have misrepresented the system. 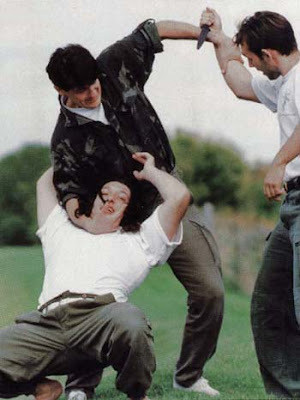 I should have just shut up and waited to be educated, because from what the Journal guys are saying, Systema appears to be a highly effective, parallel evolution of aikido, and appears to be paired with some great modern training methods. I'm looking forward to getting some better, more representative video info about Systema. Thanks again, Aikido Journal, for the link love and for the education.